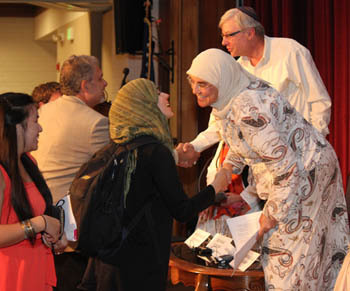 The Center produces interfaith speaker events for the Saint Mary's and East Bay communities to promote interreligious understanding and engagement. Speakers from four different religious backgrounds – Diane Muller (Christianity), Ameena Jandali (Islam), Ken Maki (Judaism) and Sulochina Lulla (Hinduism) – came together in an interfaith dialogue to raise awareness about the value of religious pluralism. This event was one of SMC's Sesquicentennial Year Celebration "Great(est) Conversation" events. Winner of the Mahatma Gandhi Award for the Advancement of Religious Pluralism and board member of Children of the Earth spoke on "Young Leaders on the World Stage: Cultivating Spirituality and Building a Global Community." He was joined by Center Intern Chloe Doan who shared her Children of the Earth experiences in Nepal. President of DePaul University, spoke on "A Call to Interfaith Engagement: Every Voice Matters" and how interfaith engagement is an important Catholic value, which DePaul University has embraced across its campus. Founder and President of the Interfaith Youth Core, and member of President Obama's inaugural Advisory Council on Faith-Based Neighorhood Partnerships, spoke on "Acts of Faith: Building an Interfaith Youth Movement for the 21st Century."